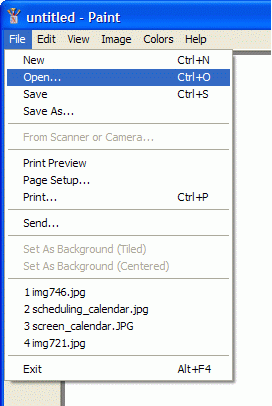 To open digital picture to add watermark to, click File to pull down a menu and then click Open. Or press Ctrl+O button combination on the keyboard. 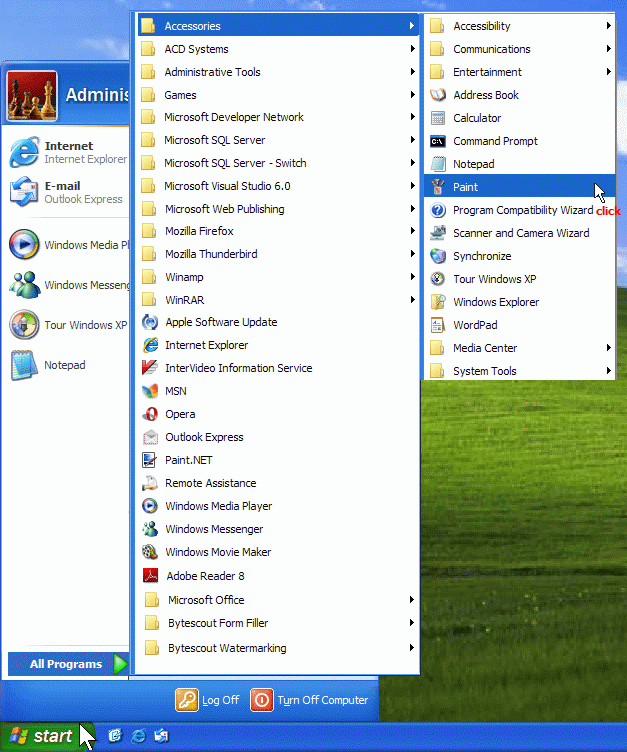 Clicking Open in file menu will bring up the Open window. 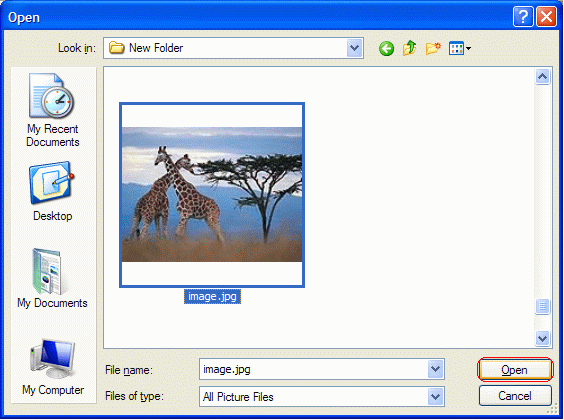 Select necessary picture file and click Open button. Now your file is opened and you can start watermarking picture. To add a text watermark over your picture, you should use the Text tool. To use the Text tool, select it from the toolbar. Then click the place of your picture where your want to place a text watermark. You will see a rectangle which will be the boundaries of your text. You can move this rectangle around by clicking and dragging on its borders, and resize it by clicking on the tab buttons at the corners and midpoints of the edges. After drawing the text boundary, a floating Font window (AKA text toolbar) will appear. There you can choose the font name, size, and style (bold, italic, or underline). Text color can be chosen from palette in the bottom of the Paint window by clicking needed color box. 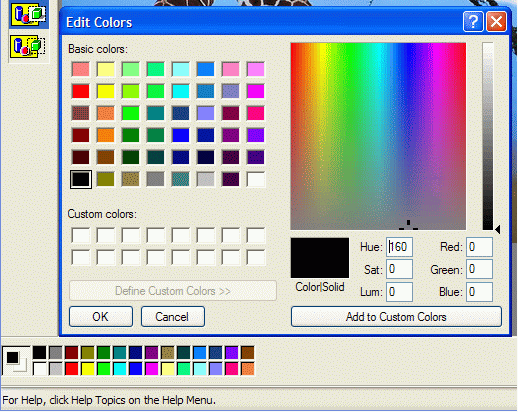 If you want to define custom colors, double-click any color bow to open Edit Colors window. Also, the fill space within text boundaries can be of a background color (right-click any color box of a palette to choose background color) or transparent. To allow the image to show through behind the text, choose transparent filling as shown below (this style is preferable for text watermarks). So, now you can start typing your text. If needed, you can at first type the text and then adjust all settings as shown above. When you’ve typed the text and adjusted its options, click any place outside of the text boundary to finish editing. Note After clicking outside of the boundary, text is not editable anymore! It will behave as common pixels which can be moved or erased, but can’t be edited as a text. So, make sure you’ve done everything to your liking before finishing. Also, be careful not to click outside of the boundary while editing your text. Also, you can make text watermark fitting your picture so that it can’t be cropped. Just set a larger font size and place your text in the middle of the picture. Then choose necessary fill style for your rectangle – with empty outlines, filled outlines, or filled with no outline. I’ve chosen the latter. Then draw a rounded rectangle. Click a place on the picture where you want its upper left corner to be, drag diagonally and release the mouse button where you want the lower right corner to be. Then type your text inside of the rectangle, and you’ll get a text annotation watermark added to your picture. 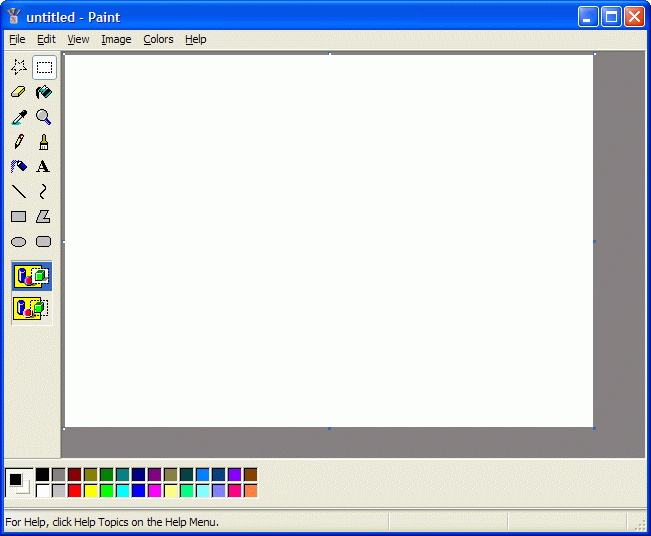 The main advantage of MS Paint is that you can use it free of charge if you use Windows OS. 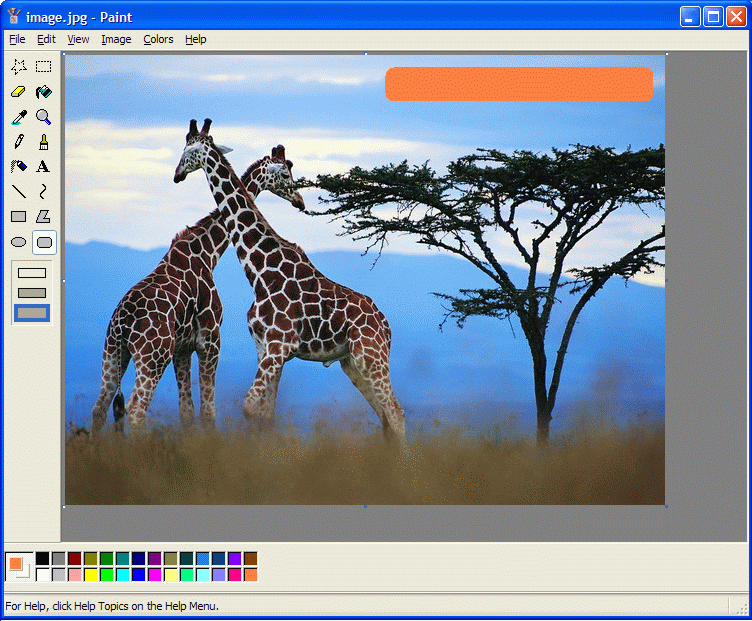 But watermarking in Paint is not so easy and quick as in special photo watermark software. 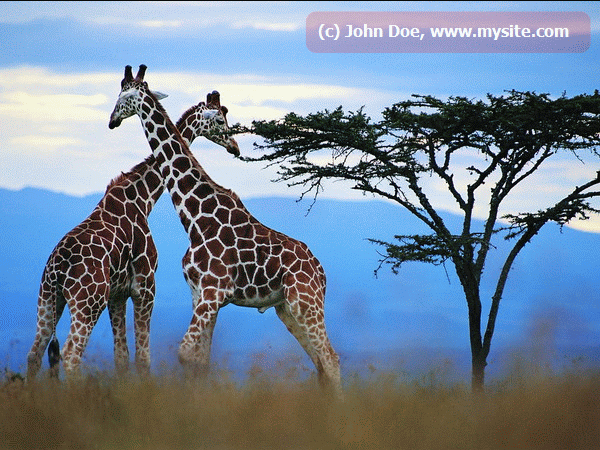 Being translucent, watermarks added with Bytescout Watermarking Pro not interferes with the user experience of the image. Also, they look more elegant than Paint watermarks. 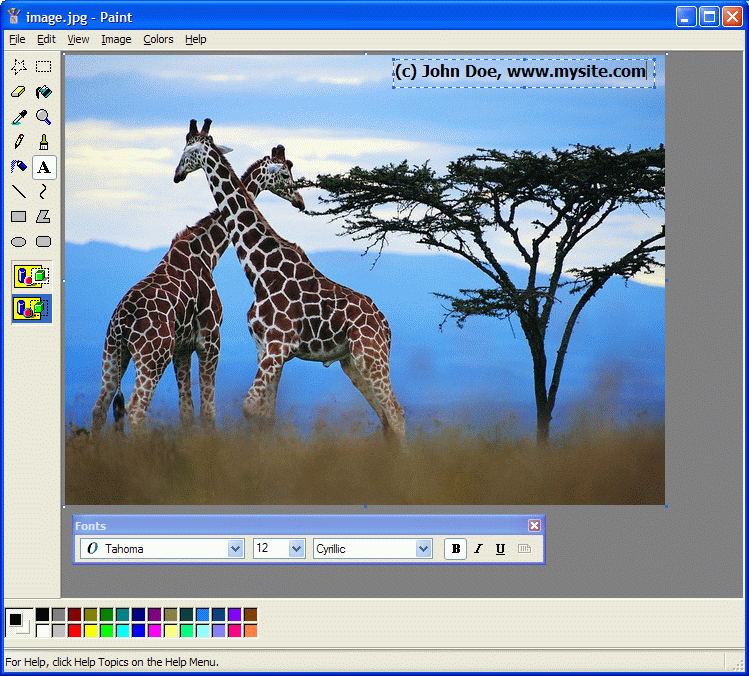 But the main advantage of using special photo watermarking software like Bytescout Watermarking is that this software simplifies watermarking process. Watermark can be added within a minute. Also, Bytescout Watermarking can batch add watermark, so you can apply watermark to multiple images simultaneously. If you spend money on watermarking software, you’ll never spend time and efforts for applying watermarks manually.